1. If the team has gray or silver in their color scheme. 2. If the team is wearing an older design or a new design that mimics an old-time football feel. 3. If the team plays football. Other than that, gray masks should be avoided. Just like cheap,lowly College teams like .....checks notes.... Alabama. I know what you mean. I dated a girl from New York for awhile and learned that my perceptions didn't always line up with reality. Probably the biggest mind-blower was that Brooklyn skewed a lot more towards the Yankees than I expected, despite hosting a Mets farm club and the Mets being intended as a replacement for the Dodgers (and Giants). As far as the Jets, I usually associate them with a similar footprint as the Mets (Queens/Long Island, with smatterings of the other boroughs and New Jersey). And I tended to assume that if someone was a Mets fan, then they also liked the Jets. 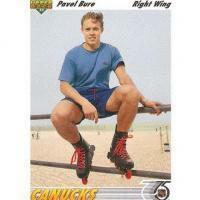 But I learned that wasn't always the case either. No doubt moving out of Shea well over a generation ago has much to do with that. Nowadays you have all sorts of combinations now that the "new blood"- Jets, Mets, Islanders and Nets- have all been around 40+ years. I'm Jets/Knicks/Rangers/Mets, so I've seen things that'll turn you green...and not with envy. Honestly, I would prefer the crazy absurd leak that came out before...again, would you would rather die by knife to the heart, or head cut off? You're still gonna die. Totally agree. For a team that had a very traditionally look like the Jets, the best way to break away from that would be to go with a well designed ultra modern design like the mock up above. Instead, if the leak is true, they went laterally traditional which is kind of change for change sake. Played it safe and look mediocre. I’m thinking a hard stop to replicate the slash angle thinger. I was just about to post this. I'm very curious as well. My guess is, if these are like the other Nike designs (e.g., Browns, Bucs), they will terminate at the name plate instead of wrap around. I hope there is some symmetry. Take the logos off and remove anything that has jets on it. 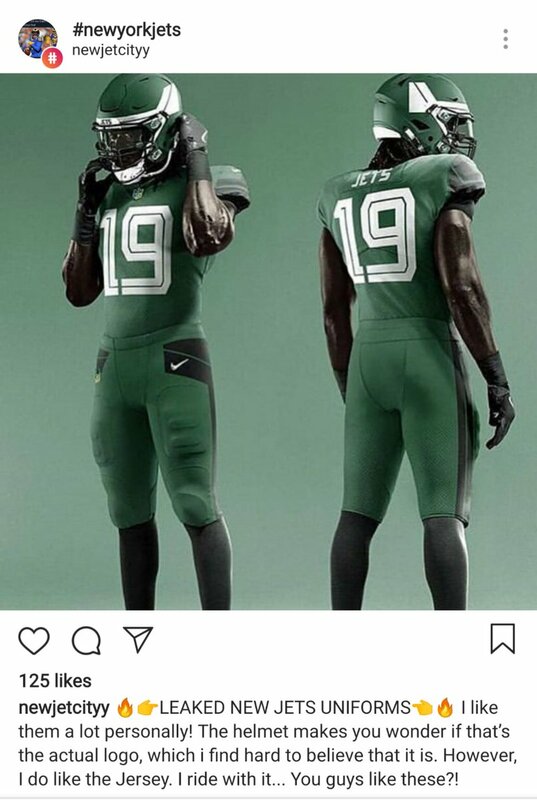 Now show it to somebody will they think its the jets if not then the design team failed. That's an interesting perspective. I'm always intrigued by how the multiple NY teams in sports are perceived by non-New Yorkers. I’ve always viewed the Yankees, Giants, Knicks and Rangers as the white-collar teams, and the Mets, Jets, Nets and Islanders as the blue-collar teams. The angle of the sleeve stripes was a subtle detail that was lost in translation when Nike took over. Nike may not have designed the uniform, but improved it considerably by correcting this (even if it was initially intended to arch over the maker’s mark). I have a feeling it’ll terminate under the nameplate as a seemingly natural way to mimic the slash we’ve seen in various graphics. Ending it at the cuff seam would make it rounded and ending it anywhere else would seen unnatural. I mean, if they know it’s an NFL team, then the only other option for a green/black team is the Eagles. I think it’s reasonable to assume that most people would think this is the Jets before they think of the Eagles. If they don’t know it’s NFL, well... the guesses will be all over the place. If they’re a football fan, quite a few names could come before they think Jets. North Texas? Marshall? Saskatchewan (sp?)? But then again, if you’re not a uniform person, would you recognize the Texans if you took all of the logos off? The Chiefs? The Bills? The Cardinals? I don’t think “is it recognizable without logos” is a good test, because very few WOULD be recognizable without logos IMO. They do look a bit like Saskatchewan's. I like these better fwiw. I think it would be really cool if they wrapped around for a contrast-colored nameplate - not that there's any reason to think they will. Are those helmets just green or are they some sort of black/green flake combination reminiscent of the gradient we’ve seen on the poster? The shades parts of the helmet almost seem too dark. I think the same thing. If there is a gradient, I hope it isn't too obnoxious and that the finish is glossy on all parts of the helmet. No need for primer black like the former Jaguars set. That's just the ridge on the Revo Speed helmet.